ByteGrid’s colocation services and data center solutions are here to support all your business IT needs. ByteGrid’s premiere data center and colocation services offer ultra-secure, scalable, and operational excellence for your mission critical IT systems. Our carrier-neutral, highly compliant data center facilities are conveniently and strategically located. ByteGrid’s managed colocation service is available to clients who prefer us to do the work for you! Our managed colocation services remove the need to build, staff and manage your in-house server rooms giving you the freedom to focus on your core business activities. With multiple company owned and operated compliant data centers across North America, we offer world class IT facilities, network, power and security. All ByteGrid data centers are equipped with full UPS power back-up systems and N+1 (or greater) redundancy for high availability for your infrastructure and disaster recovery requirements. ByteGrid’s data center employs 24/7/365 security to ensure the very best protection for your equipment. What’s more both our physical and access controls have been 3rd party audited and validated so you can rest assured you are getting the very best. ByteGrid is able to achieve power densities to meet any customer needs. With floor loads capable of supporting super computing environments, and power distribution at the 120/208 and 277/480 levels, we can provide a solution to meet the most exacting density demands. 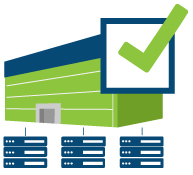 ByteGrid leads the industry when it comes to compliant data centers and colocation services. We have CISA, CRISC & CISSP certified staff and a host of accreditations and certifications and meet compliance standards including: SOC 2 Type II, EHNAC, ISO 9001, HIPAA-HITECH, FDA, FISMA, PCI to name a few. Download our Regulatory Roadmap to learn more. ByteGrid interconnection service pulls multiple network carriers to seamlessly connect your environments. Leveraging our cloud and/or managed data center services enables you to connect your IT infrastructure for a true hybrid solution.